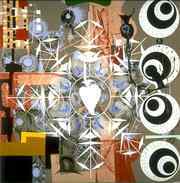 A Review of "Lari Pittman at LACMA"
Lari Pittman has emerged as a major figure in a new "school of Los Angeles." In contrast to various of its local predecessors, this southern California school embraces formal and material complexity, insists on conceptual and emotional depth, and reacts to social issues in psychologically charged ways. 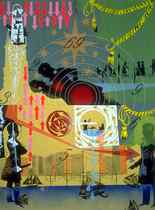 Pittman - whose mid-career retrospective spans the 1980s as well as the last half-decade - is a true practitioner of neo-expressionism. Better put, he is a practitioner of true neo-expressionism. Instead of inchoately spewing his soul onto the canvas, Pittman genuinely seeks to address complex subject matter. He presumes our ability to comprehend multiple messages in a busy, compact painting. Also, he recognizes that ideas and themes, no matter how diverse, must contrast and balance one another. The success of Pittman's approach stems partly from his inspired decision to modify neo-expressionism with decidedly un-expressionist techniques, most notably the earmarks of 1970s pattern painting. Rather than posit massive groupings of awkward figures, his paintings bristle with signs rendered with exacting delicacy and often archaic decorousness (Rococo filigree, Romantic-era silhouettes). His compositions are marked with powerful rhythms and monumental symmetry. This balance of visual density and formal cohesion marks even the earliest works in Pittman's retrospective. Although probing and somewhat clumsy, the paintings from the early and mid-80s (some built out from the wall) are as expansive, eclectic and witty as his more recent works. The earlier pieces are in some ways the most affecting of Pittman's works, because they are the least affected. They admit to artifice as readily as anything Pittman has done since, but they exude the loopy ingenuousness of a bright, eager student or large puppy. The sense of narrative that runs through his more recent work courses coyly, through these map- or rebus-like paintings. Since then, Pittman has deliberately made affectation a central factor in his work. In purely formal terms, the sometimes slick surfaces, lurid palette, linear precision and increasing cartoon-like forms that have characterized his painting in the last decade serve to clarify his imagery, directing our attention to the subjects and messages (often explicitly written, in Pop-like print or exaggeratedly delicate penmanship). But affectation itself is a "subject" of Pittman's work, a declaration of identity central to his efforts as an artist and a human being. Part of what Pittman is saying is how he's saying it. Manner in this case is meaning. Pittman practices hyperbole, elaboration, artifice and an edgy sensuousity, neither to break aesthetic taboos, nor to shock, but to assert the validity and distinction of the worldview underlying these characteristics. It is a pluralist view, appropriate for a native resident a great multicultural center as well as the son of parents from disparate ethnic backgrounds. It is also the view of a proud minority wishing to explore his otherness. Many critics have cited Pittman's homosexuality as a key factor in his style and subject matter. If anything, however, his subjects are transmorphous in their polyperversity. The images and inscriptions crowding his canvases throughout the last decade suggest all manner of identity and interaction, sexual and otherwise. The most recent paintings, for instance, brim with gangly, balloon-headed figures (rather like Indonesian shadow puppets) whose gender is apparently female but whose genitalia are not. Such hermaphroditism is hardly the exclusive province of gay men. Pittman's gayness actually manifests itself more directly in his style. His approach, balancing outrageous excess and delicate, luminous refinement, knowingly and unapologetically partakes of the camp aestheticÐwithout being trapped by it. His style may be queer, but it is hardly hip. Nor, for that matter, is it masked, fey, comically ugly or exaggeratedly beautiful. Pittman pronounces his sexual identity in ways that barely hint at Warhol, Hockney, Bacon, or any other gay male artists of previous generations. His visual and conceptual models are in fact more feminist than effeminate: with their reliance on patterning and decorative elaboration, Pittman's pictures hark back to the "woman's work" of the 1970's. Although heavily dependent on homosexual tropes, Pittman's iconography covers a wide range. For Pittman's art, gayness is not a raison d'etre or the subject per se; his sexuality is a crucial component of his life and his view of the world. The volcanic energy of the work is tinged with darkness, but affirms life in little less than ecstatic terms. It may be melodramatic to attribute this mercurial energy to Pittman's brush with mortality a decade ago when he was shot by a burglar ; his previous painting had much of this verve, if not as much flair. But the long process of physical and psychological recovery did result in the lifting of inhibitions, aesthetic, social and personal. The only remaining aspect of Pittman's art that could be seen as inhibited is its exacting techniqueÐmuch more exacting, ironically, than before the attack. Yes, Lari Pittman's art is gay art. And yes, it is gay art of a more affirmative kind than almost anything that has come before. But before it is gay art, it is good art. It affirms Pittman's sexuality and his humanity, and his skill at conveying both to a wide audience.